In 1938 American physicist Luis W. Alvarez discovered the K-electron capture process, in which the absorption of one of the electrons in the first orbital of the nuclear shell causes some atomic nuclei to decay. In 1939, working with Felix Bloch, he obtained the first precise measurement of the neutron's magnetic moment (spin and magnetic characteristics). During World War II he worked on microwave radar research, then joined the American project to develop atomic weapons. He helped design the detonating device used in the first plutonium bomb, and flew aboard the Enola Gay as it dropped the bomb on Hiroshima, Japan, the first use of an atomic weapon in wartime. Returning to Berkeley after the war, he designed and oversaw construction of the first proton linear accelerator, completed in 1947. 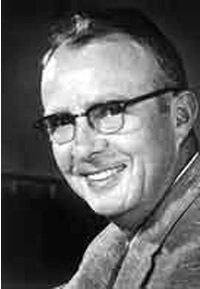 In 1951 he proposed charge exchange acceleration, which led to construction of the first Tandem Van de Graaf accelerator and a 72-inch liquid hydrogen bubble chamber, much larger than previous such devices, in 1959. In 1958 he invented a stroboscopic golf-trainer to help analyze and improve his golf swing. In 1968 he invented a stabilizing optical system for binoculars and cameras, and in the same year he won the Nobel Prize for Physics in 1968. Still, arguably his best known scientific accomplishment was yet to come. In 1980, collaborating with his son, geologist Walter Alvarez, he proposed that repercussions from an asteroid or comet impacting the Earth caused the extinction of dinosaurs. Alvarez's theory, which has been increasingly accepted, postulates that the asteroid impact caused dense clouds of dust which blocked sunshine worldwide, darkening and cooling the Earth, and that accumulated greenhouse gases after the dust settled then caused temperatures to rapidly rise past pre-impact levels, a traumatic swing of circumstance that caused the extinction of about 70% of plants and animal species, including the dinosaurs and other large mammals. His father was a research physician at the Mayo Clinic, the namesake of an abdominal ailment called Alvarez' syndrome, and after retiring from medicine he became a widely-syndicated newspaper columnist. The younger Alvarez studied under Arthur H. Compton at the University of Chicago, and his sister was Ernest Lawrence's secretary, which helped him land his first job at Lawrence's lab the University of California at Berkeley immediately after earning his doctorate. Friends, family, and students called him "Luie".